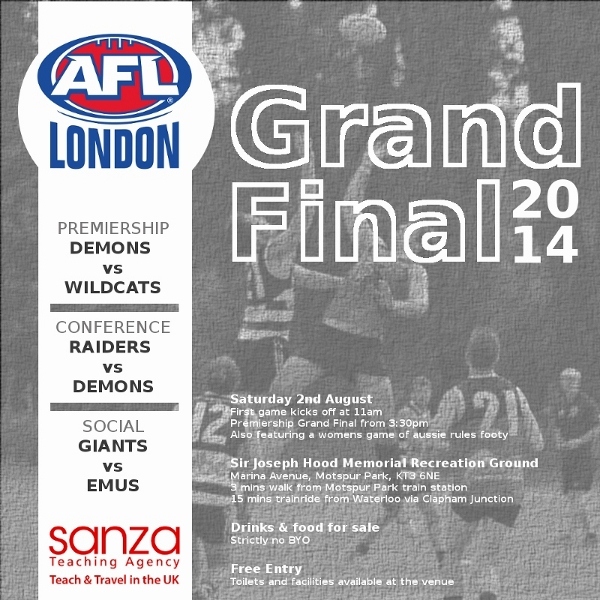 Tomorrow sees the AFL London Grand Final matches take place as footy in London reaches the season crescendo. Thanks to Chris Rea for the previews. 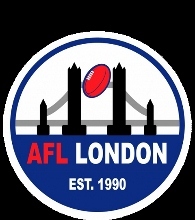 Once again the old rivals will meet in an AFL London decider. If games to date this year are any indication, this one will be a ferocious contest. It has three years since these two proud Clubs last faced off in a Grand Final. Don’t expect that to reduce the tension however, as over the course of 25 years of Aussie Rules footy in London there is no bigger rivalry. The Demons rebuilt over the off Season, following a disappointing 2013 (by their standards). With plenty of new recruits joining and new leadership from within, they tackled 2014 with renewed confidence. Their first (and only) misstep was a 1 point loss to the Wildcats in Round One and since then the Demons have taken all before them. A narrow win over the Wildcats earlier in the finals series gave them a direct path to the Grand Final, and they’ll be hoping the extra rest gives them an edge. The Wildcats are the reigning Premiers, however haven’t had it all their way in 2014. A strong first half to the Season was followed by some very tough games in the latter parts of the Season. They have had to take the longer road to the Grand Final, and only last weekend required 2 goals in the last 90 seconds of the game to sneak over the line against North London. While there is no doubting the ability of the team, the challenge for the Wildcats will be to find another level following two tough games in a row. For the Demons: Watch out for AFL London Best & Fairest (and leading goal kicker) Trent ‘Tractor’ Georgiou to prove a handful, while veteran Mark Brescacin will be hoping for one more Premiership medal. For the Wildcats: Up front Brad Collins will make a mark on the scoreboard, while Todd Pfeiffer and Brad Wedgewood will keep things moving along in the middle. Our prediction: A thriller, however the Demons should prove just too strong this time and take the win by 11 points. It’s a West London versus Wandsworth derby in the Conference as well, with the fast finishing Demons taking on the all-conquering Raiders. Since the Conference Division began, the Raiders have incredibly managed to win all but one Premiership! Their depth and quality has once again proven to be a step ahead in 2014, but will it translate into a Grand Final victoryω If their last game two weeks ago is any indication, they won’t be overawed. The Raiders demolished a strong Lions outfit to the tune of 20 goals, and will also take confidence into this game following two big wins over the Demons during the year. In contrast, the Demons have found form at the end of the Season. They beat a very competitive Swans team early in the finals, and last week were hugely impressive in beating a fading Lions side. With quality players all over the pitch, there is no side better placed to knock off the reigning champions. For the Demons: Captain Coach John Diano provides a focal point for their attacks at full forward, and is the key to their chances. Our prediction: No team knows how to win Grand Finals like the Raiders. It’s hard to see that run ending this year, and the Raiders will take home another Premiership Cup with a 19 point win. It’s a showdown between the newest Club in the League, and a side that is never far from the top of the table in the Social Division. This year we may be seeing a changing of the guard in the Social Division. The Giants have taken all before them, beating most sides comfortably during the regular Season. This weekend will mark their first ever visit to a Grand Final, and they will be desperate to finish the year on a high. The Emu’s, as always, have led the way for much of the year. Their incredible depth across the West London Club continues to serve them well, and they benefit from the experience and skill of several veterans in the ranks of the Emu’s team. Only the Giants have proven to have the ability and willingness to match them. Two weeks ago the showdown between these two teams went right down to the wire. That time it was the Giants who came from behind to book a spot in the Grand Final. For the Giants: Watch out for Captain Lee Jarvis in the middle, while club stalwarts Guy McGrath and Dave Field will be very keen to finish the year on a high. For the Emu’s: ‘Froggy’ Triplet up forward teams will with Jeremy Landberg, to kick winning scores on a regular basis. Our prediction: A tight game from start to finish, however this one will see a Giant boilover as the new Club from South East London take home their first silverware. All games are held at Sir Joseph Hood Memorial Recreation Ground, off Marina Av, Motspur Park, KT3. Car parking is available at the ground, and it’s a direct 15 minute train ride to Motspur Park Station from Waterloo or Clapham Junction. Games begin at 11am for the Social Division Grand Final, followed by the Conference Division at 12:45pm and the Premiership at 3.30pm. A ladies exhibition game will also feature, kicking off at 2:30pm.